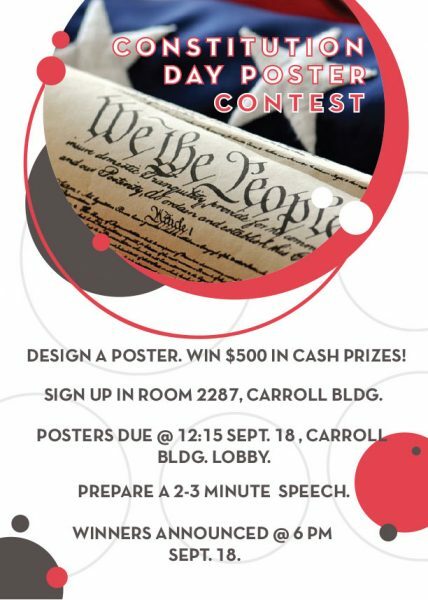 There is still time to sign up for the Sept. 18 Constitution Day Poster Competition and compete for $500 in prizes (1st place: $300; 2ndplace: $150; 3rd place: $50)! Henderson Library has the beginnings of a MakerSpace, with high tables students can use to make posters, and a few supplies students can check out from the Checkout Desk. Sign up for the competition in the main office of the Political Science Department (Carroll Building, second floor). Each registrant will be provided with a tri-fold tabletop poster, instructions, and a “Poster Provided by Zach S. Henderson Library” label. Deliver your completed project to the first floor rotunda area of the Carroll building by 12:15 p.m. on Sept. 18. Display tables will be provided. Be prepared to give a 2-3 minute talk about your research during the 12:30 p.m. – 1:45 p.m. poster display period. Defense Attorney Patrick McNally and Senior Lead Attorney Elizabeth Matherne will discuss the rights of non-citizens under the U.S. Constitution. Elizabeth Matherne is the Senior Lead Attorney for the Southern Poverty Law Center’s Southeast Immigrant Freedom Initiative. Top Rated Criminal Defense Attorney Patrick McNally recently won a groundbreaking case before the U.S. Supreme Court concerning the 6th Amendment right to counsel: Lee v. United States, 137 S. Ct. 1958 (2017).